Correction An original version of this article incorrectly referred to Annual Performance Report score as a Missouri Assessment Program score. MAP is one factor used to calculate a district's ARP. Columbia Public Schools' Annual Performance Report score dropped a couple percentage points compared to last year, according to data from the Missouri Department of Elementary and Secondary Education. Last year, the district received an 86.8 percent overall score on the state's annual report card for districts, or APR. The report uses test scores, college and career readiness, attendance, graduation rates and other factors to determine school district accreditation. This year's score was 84.3 percent. School administrators believed this was a result of low attendance and the lack of Algebra 1 and English 2 being factored into the Missouri Assessment Program test scores. They noted that Algebra 1 with advanced students usually boosts the district's scores. As part of the overall report, the MAP calculates a score based on the overall academic performance of students. 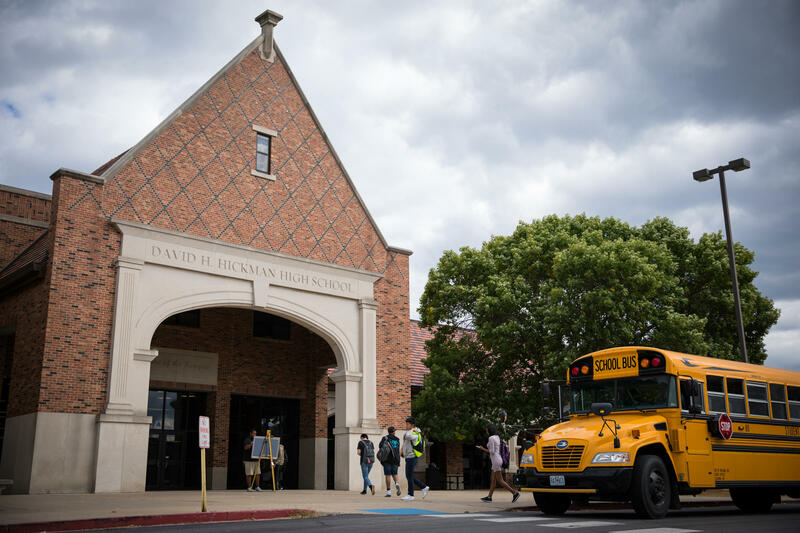 "When we looked at our competitor districts, like North Kansas City, Springfield, or Hazelwood, their scores went down," Superintendent Peter Stiepleman said. "We all have the opinion that if our Algebra 1 scores, which is 1,200 scores, had been included that we would have seen an increase." While the test results are important for the district's accreditation process, district spokeswoman Michelle Baumstark said the schools are more focused on results from formative assessments in the beginning, middle and end of the year. These tests, she said, are a better portrayal of the students' growth. The annual MAP test calculates student's progress in math, social studies, science and English. The district saw an increase in third-grade and fifth-grade math scores but a decrease in eighth-grade math scores, Stiepleman said. A student can earn one of four achievement levels based on their MAP score: below basic, basic, proficient and advanced. The test is used to help with decision-making, Baumstark said. "We use it to tag areas where we need to improve," she said. "We drill down into the data and try to use pieces of that to help better inform what curriculum we put in place." More Columbia students scored in the below basic level of this year's MAP than students statewide. But more Columbia students also scored in the advanced level than students statewide, according to the state's data. The same pattern occurred in last year's results. Another main focus for the Columbia school district is getting more students to attend to school, Stiepleman said. Senior attendance is low, he said, with only 74 percent of seniors having an attendance of 90 percent. "Our kids have got to come to school," he said. "You can’t learn if you’re not in school." Supervising editor is Sky Chadde.